'Milford Sound' is ranked highly among Eugene von Guérard’s sublime Romantic interpretations of the landscape. The spectacular fiord in New Zealand’s South Island held a strong appeal for the artist. Encompassing the view to the north-west, seen from the head of Milford Sound, the painting also depicts the vessel on which von Guérard had travelled to the fiord, at anchor below Cascade Peak. Produced in his Melbourne studio, 'Milford Sound' was worked up from numerous earlier drawings made on the spot. The painting is broadly faithful to these sketches, in accordance with an approach grounded in the principles of German Romanticism. The richly decorated 19th-century frame was made by Isaac Whitehead, the most prominent frame-maker in Melbourne throughout the 1860s and 1870s. Signed and dated l.r., red/brown oil "J: Eugene von Guérard/ 1877.9.". Tim Bonyhady, Eugene von Guérard: nature revealed , 'The tipping point', pg. 36-41, Melbourne, 2011, 41, 262, 264 (colour illus. ), 265, 296. Mary Eagle, A story of Australian painting , 'God in nature: portraying the country', pg. 52-70, Sydney, 1994, 56. Simon Gregg, New romantics: darkness and light in Australian art , 'The glacial', pg. 96-129, North Melbourne, 2011, 109, 110 (colour illus. ), 111. Camille Guy, The New Zealand herald , 'Spanning the centuries', pg. 6, Auckland, 27 Mar 1990, 6 (illus.). Review of Two centuries of New Zealand landscape art exhibition. David Hansen, Art & Australia , 'Eugene von Guérard: Nature Revealed', pg. 674-675, Sydney, Winter 2012, 675 (colour illus.). Helen Verity Hewitt, Art and Australia (Vol. 36, No. 2) , 'Patrick White's Choice', pg. 244-250, Sydney, 1998, 248. Simon Ives, Artist profile [issue 16] , 'Painting restoration', pg. 108-110, Sydney, 2011, 108-109 (colour illus. ), 110. Christopher Johnstone, Landscape paintings of New Zealand , 'Preface to the expanded edition', pg. 7-8, Auckland, 2013, 7, 276, 277 (colour illus.). Jack Leigh., The New Zealand herald , 'Vista embrace two centuries', Auckland, Feb 1990. Review of Two centuries of New Zealand landscape art exhibition. Ian Lochhead., The Press , 'Art review: N.Z. landscape art', Christchurch, 14 Apr 1990. Review of Two centuries of New Zealand landscape art exhibition. Ruth Pullin, The journal of New Zealand art history , 'Eugéne von Guérard and the Geognostic Landscape of New Zealand', pg. 1-16, Dunedin, 2009, 10,11 (colour illus. ), 12, 14. Anne Ryan, Australian art: in the Art Gallery of New South Wales , 'Colonial eyes', pg. 17-36, Sydney, 2000, 18, 32 (colour illus. ), 300. Peter Shaw, Metro , 'Lively arts: back to the land', pg. 156-157, Auckland, Feb 1990, 157. Review of Two centuries of New Zealand landscape art exhibition. Keith Stewart, Listener & Tv Times , 'Sweeping panorama', pg. 102-105, Auckland, 02 Apr 1990, 105. Review of Two centuries of New Zealand landscape art exhibition. Mark Stocker, The Burlington Magazine , 'Exhibition reviews: Auckland, Wellington and Christchurch New Zealand Art', pg. 441-442, London, Jun 1990, 441. Ian Wedde., Dream Collectors: One hundred years of art in New Zealand , 'Collecting Dreams', Wellington, 1998, 17, 32, 33 (colour illus.). Art of Australia. Vol 1: Exploration to Federation , 'The mania and force of the stream', pg. 149-224, Sydney, 2008, 202-203 (colour illus.). Eugen von Guérard's Australian Landscapes , Melbourne, 1975, 32. The Argus , 'The November Magazines. No. II. ', pg. 7, Melbourne, 03 Jan 1887, 7. Review of J.A. Blaikie's article 'Art in New Zealand' in The Magazine of Art 1887. Colonial and Indian exhibition, London, 1886: catalogue of New Zealand exhibits. , London, 1886, 3. titled 'Milford Sound'; Collection F.G. Dalgety, Esq; Section New Zealand Group, Works of Art, Class 1. The Argus , 'The pictures which have gained awards', pg. 7, Melbourne, 16 Mar 1881, 7. Fourth Order of Merit - E. von Guerard, "Milford Sound". The Argus , 'Melbourne International Exhibition awards', pg. 6, Melbourne, 04 May 1881, 6. II. - E. von Guerard - Milford Sound, N.Z. The Sydney Morning Herald , 'The Exhibition', pg. 7, Sydney, 11 May 1880, 7. 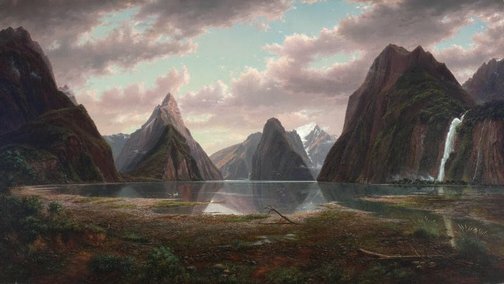 Victoria: Von E. Guerard, "Milford Sound, New Zealand"- extra first. The Argus , 'Sydney Exhibition awards (by electric telegraph)’, pg. 5, Melbourne, 19 Apr 1880, 5. Melbourne International Exhibition 1880: The official catalogue of the exhibits with introductory notices of the countries exhibiting. , Melbourne, 1880. cat.no. 85; titled 'Milford Sound, New Zealand'; Section Class 1 - oil paintings. Awarded Second Order of Merit. New Zealand Mail , 06 Dec 1879. Sydney International Exhibition: Official catalogue of exhibits , Sydney, 1879, 467. cat.no. 306; titled 'Milford Sound, with Pembroke Peak and Bowen Falls'. Awarded a First Degree of Merit Special for Landscape Painting. Victorian men of the time , Melbourne, 1877, 75. The Australasian , 'Fine arts. The Academy of Arts exhibition. ', pg. 7, Melbourne, 24 Mar 1877, 7. Bendigo Advertiser , 'Melbourne', pg. 2, Bendigo, 19 Mar 1877, 2. The Argus , 'The Academy of Arts exhibition', pg. 8, Melbourne, 17 Mar 1877, 8. Argus , Melbourne, 18 May 1878, 4. Otago daily times , 'The Otago's trip to Milford Sound', Dunedin, 28 Jan 1876. The Australasian Sketcher: with Pen and Pencil , 'Facts & scraps', pg. 171-174, Melbourne, 20 Jan 1877, 174. Article quotes passage from The Argus, January 2nd 1887, pg. 4. Patrick White, painter, manqué: paintings, painters and their influence on his writing , 'Patrick White's choice', pg. 114-119, Carlton, 2002, 117. Imant Tillers: one world many visions , 'Bringing the periphery centre stage', pg. 33-34, Canberra, 2006, 33 (colour illus.). Images in opposition: Australian landscape painting 1801–1890 , Melbourne, 1985, 79, 80, 81.